Since pyrometry measures surface temperature, anything that affects the surface has the potential to affect the results of pyrometry. Chemical vapor deposition affects the surface of a substrate by depositing material on it. Chemical vapor infiltration is the term applied when the substrate is porous; the material is deposited on the surface and within the substrate as far as it can penetrate. A CVI application involves large furnaces loaded by hand with materials of different sizes. The process gas is blown in from the bottom of the furnace, which is inductively heated. The cold gas entering at the bottom causes a temperature gradient in the furnace, which complicates manufacture. Since the CVD/I process is very sensitive to temperature, parts processed at cooler locations do not gain as much material as those in warmer locations. Consequently, the manufacturer must use several cycles to reach design specifications. Besides the extra work of loading and unloading the furnace, parts are tracked: those loaded on the bottom are next loaded on top to achieve uniformity of deposition. The furnace is physically capable of being heated in zones to achieve a constant, optimal temperature from top to bottom. The problem is that the internal temperature gradient is a complex function of the furnace loading, which is different every time. The manufacturer verified this with an empty run using thermocouples. This meant that instead of a permanent temperature profile being programmed into the controller, the actual temperature gradient must be measured for each run. A sketch shows the temperature measurement technique formerly in use and the one we proposed. The former technique used a hand-held pyrometer aimed at a mirror mounted above the furnace. A single location in the center of the furnace provided the target for the pyrometer. This was the only temperature available. Temperature measurement techniques in a CVD furnace: the old technique is at left, the replacement is at right. 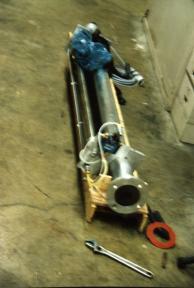 A vacuum probe with both vertical and rotational travel was fabricated. It measures in the direction perpendicular to its axis. The fiberoptic interconnection allowed it to be easily coupled to a SpectroPyrometer to form a complete temperature measurement system. Vacuum probe for CVI furnace; probe reciprocates and rotates to provide complete coverage. Results from use of the vacuum probe are shown below. From this it is clear that temperature is not just a monotonically decreasing function of height. Temperature gradient as a function of height in a CVI furnace. Probe angle of view was held constant.